As some of you may know, Expowest Cornwall is not the only show we organise. In fact we have three other similar shows – The Source trade show in Exeter in February, The Hotel, Catering & Retail Show in Bournemouth in March, (the week after Expowest Cornwall), and The Food & Drink Trade Show at the Three Counties Showground, Malvern, which took place this week. It’s fair to say we’ve been quite busy since Expowest Cornwall! However, even though it’s been a couple of months, we’d still like to thank everyone who came to the show. So many of you came that visitor numbers were up 20% on last year! It was great to welcome so many of Cornwall’s hospitality, catering and food retail buyers, and all three days had a real buzz about them. There weren’t just more visitors to the show…there were also more exhibitors for them to see. 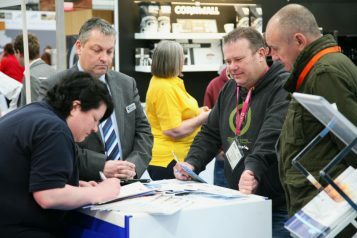 In fact 20% more visitors came to see 20% more exhibitors! Which may explain why, with the 2017 show less than two months ago, 47 companies have already booked in for 2018. That’s around 40% of the show space gone already! With exhibitors booking in at this rate, and more and more visitors attending to see them each year, it’s looking like next year’s show will be bigger too! We want to make sure the show gets better every year, not just bigger, so we carried out a post-show survey of our visitors, which made for some interesting reading. 60% had visited before, with 40% checking out the show for the first time. 53% of visitors found 3 or more suppliers, with 18% of them finding 5 or more. 69% of visitors placed orders at the show or were going to shortly afterwards, which is good news for our exhibitors and visitors alike. Better still, 92% of our visitors would recommend the show to a colleague or related business, and 99% of attendees will be back next year! It’s not all about facts and figures though. We were delighted to receive some great feedback, not just from the post show survey, but also from visitors & exhibitors, in person & on Twitter. Here’s just a few of the lovely comments made about the show. We’ll be taking all the feedback we’ve received, and seeing what we can do to make next year’s show even better. If you’ve got anything to add, please do leave us a comment here. 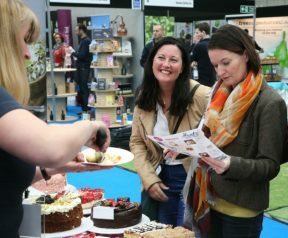 Next year Expowest Cornwall takes place from Tuesday 6th – Thursday 8th March, so why not put those dates in your diary now, and come and see what Expowest Cornwall is like in 2018? Previous Post: « Have we got news for you!